Matt Brittin, the head of Google’s Europe, Middle East and Africa business has acknowledged that Google has a role to play in removing hateful or harmful content from the internet. He told BBC Radio 4’s Today programme they can’t rely on algorithms to solve things but says that the company tries very hard to make sure the internet is a “positive force for society”. Image copyright MANUEL HOLLENBACH Image caption The smart glove can scan bar codes quickly and leaves hands free to hold other objects What one piece of technology would most improve your working life? Chances are it wouldn’t be a glove. But car workers in Germany are now using smart gloves that not only save time but prevent accidents as well. It is an example of how tech-enhanced humans are fighting back against the seemingly unstoppable rise of the robots. At BMW’s spare parts plant in Dingolfing, for example, which employs around 17,500 people, hand-held barcode readers have been replaced by gloves that scan objects when you put your thumb and forefinger together. The data is sent wirelessly to a central computer. The hi-tech gloves allow workers to keep hold of items with both hands while scanning more quickly. While this may only save a few seconds each time, BMW reckons it adds up to 4,000 work minutes, or 66 hours, a day. Formally launched in November, ProGlove’s “plug and play” Mark glove is fitted with an integrated scanner and battery with enough charge to last an eight-hour shift. It costs €1,300 (£1,095; 1,350). Other companies using the glove include rival car makers Audi and Skoda, and precision engineering firm Festo. “The access point is connected to a company’s existing system via USB or a normal serial connector, meaning the glove can be deployed with no integration expense,” says ProGlove chief executive Thomas Kirchner. In the US, sick leave costs employers $226bn (£182bn) a year, while in the UK over the last 12 months firms lost more than £4bn on leave related to minor ailments. Lifting-related injuries alone cost US businesses more than $70bn last year. After flu, back pain is the main cause of absenteeism. New York-based tech company Kinetic is trying to address this issue with a belt-mounted device that senses workers’ posture when lifting and gives them feedback when the position could be improved – by bending the knees more, for example. Managers can see all the collected data on a dedicated web page, helping them to spot areas for improvement. The Kinetic system also gives advice on how workplaces could be redesigned to reduce potentially dangerous practices. The system has recently been piloted at Crane Worldwide Logistics’ distribution facility in Texas, where it helped reduce the number of potentially damaging lifts performed by workers each day by 84%, the company says. Such wearables are helping humans give robots a run for their money. For example, aircraft manufacturer Boeing has been piloting a version of Google Glass, the search giant’s augmented reality eyewear, to help technicians wire up its planes. These highly complex webs of wires – known as harnesses – have to be connected up according to a road map that technicians refer to on a laptop or tablet. But now they can read the instructions on the head-mounted display, thanks to a specially developed app called APX Skylight, leaving their hands free to carry on snipping the wires to length and connecting them up. Boeing says the pilot saw assembly times reduced by 25%, and crucially, the number of errors fell, too. And in the mining industry – one of the most dangerous in the world – technology is helping to keep miners safe and improve production. For example, Canadian company Maestro Mine Ventilation has developed an award-winning digital gas sensor that is more accurate than traditional sensors. By constantly monitoring the quality of the air, the build-up of dangerous gases can be spotted earlier and fresh air pumped to those areas. This can also save on electricity as the fans can be operated only when needed rather than all the time. It’s not just physical injury that can lead to absenteeism – stress and illness are prime culprits in the workplace. IT giant Oracle claims its absenteeism costs have plunged by $1m as a result of wellbeing interventions such as stress workshops. US health insurer Humana believes its Goal Guru health and wellbeing app can increase productivity by improving employees’ overall fitness. The “digital coach” app gathers data from multiple fitness trackers and mobile health apps and sets challenges that staff can take part in individually or collectively – from push-ups to mountain treks. Competition between teams – and even heckling – is actively encouraged. “Goal Guru is not just about the number of steps you have done or what you have eaten,” vice president of wellness Kristine Mullen tells the BBC. The app, which is currently only available to US companies but should soon be worldwide, costs from $1 to $1.50 per employee per month for a business with 100 employees, she says. “Our research indicates that employers are now happy to spend twice as much as that because they understand the effect a cohesive employee community has on their bottom line,” Ms Mullen says. So whether it’s smart gloves, clever belts or motivational software, technology is helping to make us healthier and more productive at work. And with robots stalking our jobs, that’s probably just as well. 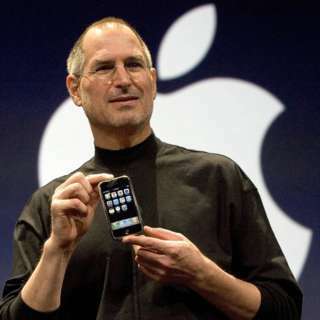 Image copyright Getty Images On 9 January 2007, one of the most influential entrepreneurs on the planet announced something new – a product that was to become the most profitable in history. It was, of course, the iPhone. There are many ways in which the iPhone has defined the modern economy. There is the sheer profitability of the thing, of course: there are only two or three companies in the world that make as much money as Apple does from the iPhone alone. There is the fact that it created a new product category: the smartphone. The iPhone and its imitators represent a product that did not exist 10 years ago but now is an object of desire for most of humanity. There’s the way the iPhone transformed other markets – software, music, and advertising. But those are just the obvious facts about the iPhone. And when you delve more deeply, the tale is a surprising one. We give credit to Steve Jobs and other leading figures in Apple – his early partner Steve Wozniak, his successor Tim Cook, his visionary designer Sir Jony Ive – but some of the most important actors in this story have been forgotten. It is broadcast on the BBC World Service. You can listen online or subscribe to the programme podcast. The economist Mariana Mazzucato has made a list of 12 key technologies that make smartphones work: 1) tiny microprocessors, 2) memory chips, 3) solid state hard drives, 4) liquid crystal displays and 5) lithium-based batteries. That’s the hardware. Then there are the networks and the software. So 6) Fast-Fourier-Transform algorithms – clever bits of maths that make it possible to swiftly turn analogue signals such as sound, visible light and radio waves into digital signals that a computer can handle. At 7) – and you might have heard of this one – the internet. A smartphone isn’t a smartphone without the internet. At 8) HTTP and HTML, the languages and protocols that turned the hard-to-use internet into the easy-to-access World Wide Web. 9) Cellular networks. Otherwise your smartphone not only isn’t smart, it’s not even a phone. 10) Global Positioning Systems or GPS. 11) The touchscreen. 12) Siri, the voice-activated artificial intelligence agent. All of these technologies are important components of what makes an iPhone, or any smartphone, actually work. Some of them are not just important, but indispensable. But when Mariana Mazzucato assembled this list of technologies, and reviewed their history, she found something striking. The foundational figure in the development of the iPhone wasn’t Steve Jobs. It was Uncle Sam. Every single one of these 12 key technologies was supported in significant ways by governments – often the American government. A few of these cases are famous. Many people know, for example, that the World Wide Web owes its existence to the work of Sir Tim Berners-Lee. He was a software engineer employed at Cern, the particle physics research centre in Geneva that is funded by governments across Europe. And the internet itself started as Arpanet – an unprecedented network of computers funded by the US Department of Defense in the early 1960s. GPS, of course, was a pure military technology, developed during the Cold War and opened up to civilian use only in the 1980s. The Fast-Fourier-Transform is a family of algorithms that have made it possible to move from a world where the telephone, the television and the gramophone worked on analogue signals, to a world where everything is digitised and can therefore be dealt with by computers such as the iPhone. The most common such algorithm was developed from a flash of insight from the great American mathematician John Tukey. What was Tukey working on at the time? You’ve guessed it: a military application. Specifically, he was on President Kennedy’s Scientific Advisory committee in 1963, trying to figure out how to detect when the Soviet Union was testing nuclear weapons. Smartphones wouldn’t be smartphones without their touchscreens – but the inventor of the touchscreen was an engineer named EA Johnson, whose initial research was carried out while Johnson was employed by the Royal Radar Establishment, a stuffily-named agency of the British government. The work was further developed at Cern – those guys again. Eventually multi-touch technology was commercialised by researchers at the University of Delaware in the United States – Wayne Westerman and John Elias, who sold their company to Apple itself. Yet even at that late stage in the game, governments played their part: Wayne Westerman’s research fellowship was funded by the US National Science Foundation and the CIA. Back in the year 2000, seven years before the first iPhone, the US Defence Advanced Research Projects Agency, Darpa, commissioned the Stanford Research Institute to develop a kind of proto-Siri, a virtual office assistant that might help military personnel to do their jobs. Twenty universities were brought into the project, furiously working on all the different technologies necessary to make a voice-activated virtual assistant a reality. Seven years later, the research was commercialised as a start-up, Siri Incorporated- and it was only in 2010 that Apple stepped in to acquire the results for an undisclosed sum. As for hard drives, lithium-ion batteries, liquid crystal displays and semiconductors themselves – there are similar stories to be told. In each case, there was scientific brilliance and plenty of private sector entrepreneurship. But there were also wads of cash thrown at the problem by government agencies – usually US government agencies, and for that matter, usually some arm of the US military. Silicon Valley itself owes a great debt to Fairchild Semiconductor – the company that developed the first commercially practical integrated circuits. And Fairchild Semiconductor, in its early days, depended on military procurement. Of course, the US military didn’t make the iPhone. Cern did not create Facebook or Google. These technologies, that so many people rely on today, were honed and commercialised by the private sector. But it was government funding and government risk-taking that made all these things possible. That’s a thought to hold on to as we ponder the technological challenges ahead in fields such energy and biotechnology. Steve Jobs was a genius, there’s no denying that. One of his remarkable side projects was the animation studio Pixar – which changed the world of film when it released the digitally animated film, Toy Story. Even without the touchscreen and the internet and the Fast-Fourier-Transform, Steve Jobs might well have created something wonderful. But it would not have been a world-shaking technology like the iPhone. More likely it would, like Woody and Buzz, have been an utterly charming toy. Tim Harford is the FT’s Undercover Economist. 50 Things That Made the Modern Economy was broadcast on the BBC World Service. You can listen online or subscribe to the programme podcast. A smart mirror which can analyse your skin and provide customised makeup patches has gone on display at a technology exhibition in Japan. “With this, layers of makeup will not be necessary and only a patch is needed,” explains one of the designers, Masayo Fuchigami. “It requires less time and it feels lighter,” she said. Among the other technology exhibited at Ceatec was a device allowing companies to create their own paper. BBC Click’s Dan Simmons finds out more. 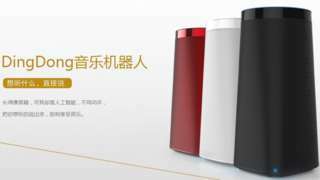 Image copyright Beijing Linglong A Chinese firm has unveiled the country’s first voice-activated smart home speaker – its answer to Amazon’s Echo and Google’s Home. The DingDong, by technology company Beijing LingLong, uses voice interaction to do tasks such as playing music and switching on home appliances. The device is said to understand Mandarin, Cantonese and basic English. A study by Juniper Research suggests China’s smart home market could be worth $22.8bn (£18.3bn) by 2018. Beijing LingLong is owned by Chinese online retailer JD.com – which is selling the DingDong for 698 yuan ($100, £81). The device can communicate with 95% of the China’s population, Beijing Linglong told Wired. Like Echo and Home, it can be used to control light switches, thermostats and home appliances. And, similar to its rivals, there is internet search, traffic and weather information, directions, online shopping, and music streaming. The makers of DingDong have also been promoting its educational tools, including being programmed with simple English lessons for children developed by a private education company. But outside of China the Linglong DingDong has garnered more social media attention for its name than for its technological innovation, with many expressing incredulity. “Millions of Americans tried their damnedest not to be racist for a day and then this story drops,” said Twitter user Steve Woodbury. If you’ve ever wondered about the infinite loop one could create by pairing two smart home assistants, it’s this. YouTuber Adam Jakowenko used both an Amazon Echo Dot, and a Google Home device to answer a simple question: “what’s on my calendar for tonight?” Using the Echo first, the device dutifully read off the beginning of a calendar notification before passing the buck on to Google Home. From there, Google started, and then passed the buck right back. TNW’s West Coast reporter covering all the comings and goings in the SoCal tech scene and elsewhere. Connect via Twitter, Facebook or Instagram.